Food 4 Thought - Issue 5 - Culatello | Blog | Di Bruno Bros. 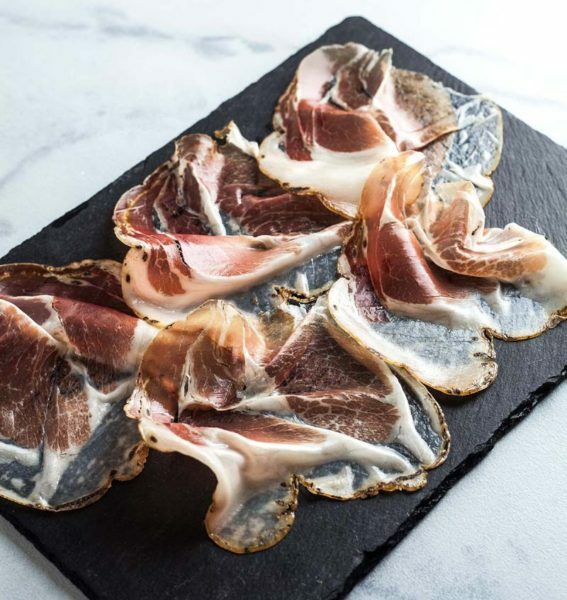 If you’re aware of Culatello, you fit into one of two categories. One is that you’ve been to Italy – likely in or near Parma – and you’ve tasted it. You have savored its sublime subtleties, reveled in its richness, and cursed the importation laws banning it in the United States. The other is that you’ve only ever heard of Culatello, its very existence a tease, a verboten temptation along the lines of ortolan or raw milk cheese aged less than 60 days. If you haven’t heard of Culatello, here’s the elevator pitch: Culatello is the heart of Prosciutto. Tender cuts of pork thigh are generously coated in sea salt, then hung to cure inside the bladder of a pig. Following the natural arc of the bladder casing, it forms a pear shape during its 10-month maturation period, resulting in a finished product that is both visually charming and bursting with flavor. In the late 1970’s, an outbreak of swine vesicular disease wreaked havoc on the Parma region and the surrounding northern provinces. As a result, the USDA banned the importation of all Italian cured meats. Salami, coppa, soppressata, Prosciutto and Culatello became contraband overnight, and carnivorous Americans panicked. (Prosciutto was permitted back into the US in the 1980’s, but the rest remained on the ban list until 2013). The positive to come out of this is the ever-growing popularity (and quality) of American craft charcuterie. Many of our best-selling products might not exist if Americans never needed to look elsewhere for their salami fix. Most of the early titans of American cured meats had Italian heritage: Fra’mani, Molinari, Biellese, and Creminelli, to name a few. This is also the case for one of the young guns on the scene: Tempesta Artisan Salumi. Tony Fiasche cures meats in Chicago, but the five generations that preceded him did the same in Calabria. If the science and artistry of crafting salumi can be inherited, then Tony was granted a significant head start. It’s in his blood, and has defined his family’s legacy for over one hundred years. We first came to know Tony though his signature product: ‘Nduja, the spicy, spreadable salami originating in Calabria. Since then, we’ve slowly added several of his products, each of which we consider to be the best of what’s around. So why would we hold off on his Culatello? Back in 2013, after four decades, the ban on Italian salumi was lifted, and so began the long and arduous journey of approving facilities for export. If you’ve ever wondered what a bunch of Italian dudes gossip about around the office watercooler, it’s salami. And for several years, all we could talk about was the latest rumor regarding when real Italian Culatello would finally be available to us. As it turns out, it took five years, and after a 45-year hiatus, Culatello landed on Di Bruno counters in June of 2018. I’ll never forget the reaction of our team when it landed. The box was torn apart the way my twins attack Christmas gifts. The Culatello was released from its wrapping and excitedly placed on the slicer, and we drew straws to determine who had the honor of slicing it. Paper-thin slices were precisely laid on the deli paper, creating a rosy mosaic. I passed it around to the team, who expressed similar appreciation to receiving a bonus check. The time was here. At long last, Culatello. We laid it on our palate and immediately identified a sweet, mild porkiness up front. We waited anxiously for the flavors to develop, to wow us. And we waited. And waited. Fortunately, we had Tony’s Culatello in our back pocket, and we’re excited to launch it in all stores this month. Imagine a leg of prosciutto at the center cut. Then take the center portion of that center cut. Three of these are used in the production of each Culatello. Tony uses only the best ingredients available: healthy, humanely-raised, ABF Berkshire Pork from local farms, and all-natural sea salt in lieu of synthetic nitrates. He cures his Culatello two months longer than its Italian counterpart. It’s also washed in wine for some added depth. It’s magical. Rich pork flavor, fruitiness from the wine, and a bit of funk from natural fermentation. It’s worth waiting 45 years for. It’s the burger you were expecting. At Di Bruno Bros., we’ve embraced American producers for a long time. 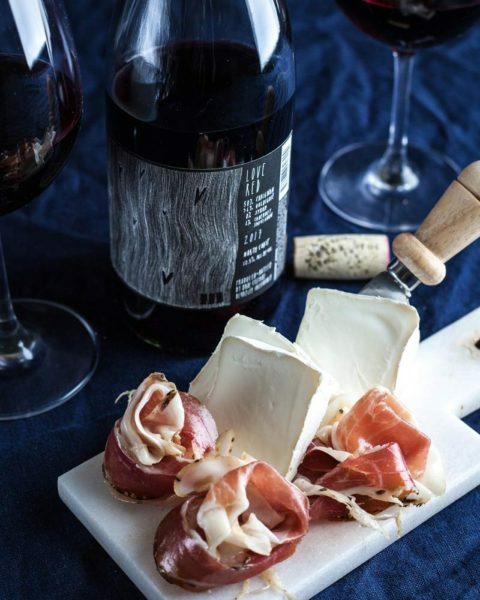 We were amongst the first retailers outside of California to sell Humboldt Fog, and we were the first East Coast retailer for La Quercia Prosciutto from Iowa. Each was met with the predictable refrain: “the European version is better.” But these products have not only survived against European heavyweights, they’ve become customer favorites. We should have known better than to assume that the Italian Culatello would outshine the Chicagoan, but every once in a while we need to be reminded of lessons learned. At least this was a tasty lesson! Please note, Culatello is currently only available in our retail stores. Plan your trip or find a location near you! Perhaps you should sell tickets to these tastings! I will buy a charter membership.